OK – I think I have the best test case yet to demonstrate why you can’t make a digital file look like Velvia 50 (at least with the Canon 5Dmk2 I used for this shot). Take a look at the following image. On the left is the Velvia 50 and on the right is the Canon 5Dmk2. Now look at the colour of the fern and then the colour of the lichen on the tree. 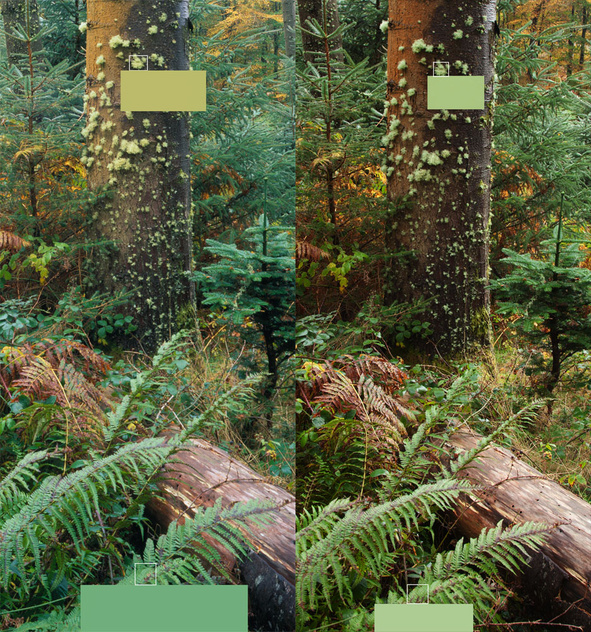 When we colour correct the digital file I think you’ll agree it’s impossible to make the lichen and the fern look like Velvia. This was all done while working on an article on film simulations but I should add that this isn’t to suggest that it’s a good goal to try to make digital to look like film. However, it is dissapointing that some digital cameras can’t differentiate different types of green, especially in vegetation. However, some cameras are better than others and in a future issue of On Landscape we’ll be comparing the Canon, Nikon and Sony (and hopefully a few others) to see which do the best job.